There are many reasons why a car owner should be sure to get regular wheel alignments. Not only does having your wheels aligned properly save you money on petrol, tyres, and other potential repairs, but it also gives you better peace of mind to know that your car is being cared for properly. Drive in Tyres use state of the art wheel alignment systems. 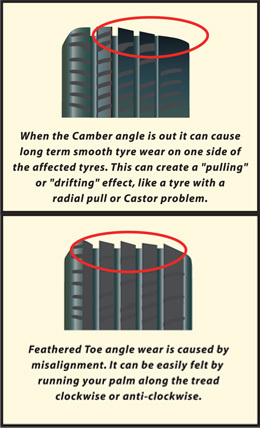 Suspension misalignment increases tyre wear and can serioulsy affect vehicle handing and cost you money!